The extraordinary beautiful sounds of crystal bowls set the stage for sound healing and well-being. The benefits of a sound journey with crystal bowls are numerous, including: stress and pain reduction, deep relaxation, self awareness, creativity, realisation of nature of mind (for those who are ready), and more. Dr. Mitchell Gaynor, an oncologist, has written “The Healing Power of Sound,” a fascinating look at how he uses sound together with traditional cancer treatments to heal patients. Every atom, molecule and cell, gland and organ of the body emits and absorbs sound. The whole body vibrates as well. We can tap into the power of sound in order to heal, awaken ourselves and expand. While we use our bodies and breath to settle the wild mind and bring clarity to it, the way of using the pure sounds of crystal bowls atunes us to the natural state of well-being through vibration. Vibration and sound is found everywhere, but what is especially effective about crystal bowl resonance is their pure and beautiful quality of sound. It atunes us to ourselves by magnetising us and getting us on it’s frequency. It atunes us to our innate healthiness and wholeness. We don’t have to look very far afield to find well-being. The bowls themselves are fascinating. They are made from nearly 100% pure crystal and are combined with one or more precious gems, minerals, special earths or elements. Thus each bowl is entirely unique with many elements coming together to provide one-of-a-kind resonance. Imagine the complex taste of wines, but in the realm of sound. Each element provides unique resonance, and when the bowls are sounded two or more harmonically, the result is restorative music that can take you wherever you want to go. There are two inner elements that we need to take a sound journey. The first element is to set our intention. Where do we want to go? What do we want to realise? What do we want to heal? We make a strong intention and aspire to meet with our desired result. The second element is to let go and relax into the sounds always keeping in touch with the resonance, with how we feel. Sound healing happens when our bodies and minds resonate together with the harmonics of the bowls and we are guided by our intention. Feeling and resonance is primary and much more powerful than just thinking. The sound healer, on stage with the bowls, also sets his or her intention. There may even be a group intention which could have even greater results. Thus the group harmony, combined with the beautiful harmony of the bowls, all resonating in the primal realm before the conceptual thought processes, is a recipe for health, well being and discovery. We find that there are limitless sound journeys that we can take, each leading to a new place. The sound healer may also sing with the bowls using the power of speech for protecting the nature of mind. So this is just a glimpse of what our sound journey with crystal bowls is like. 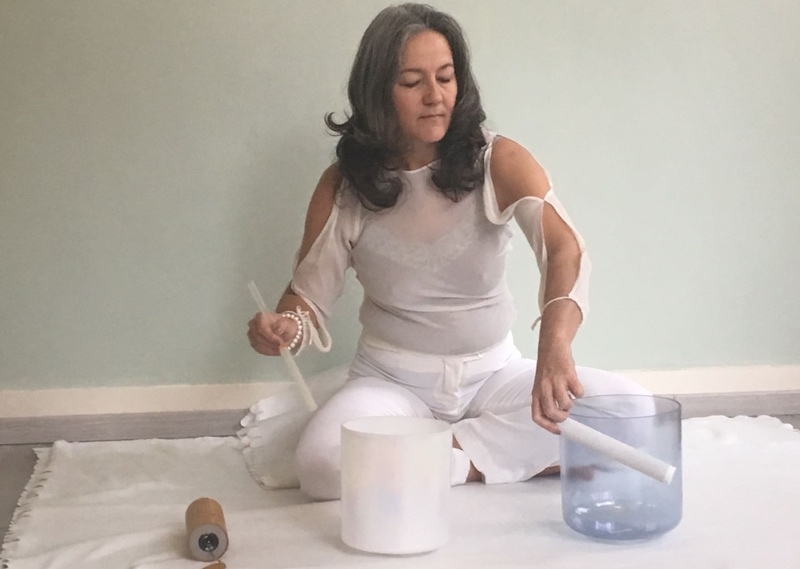 Just like in meditation practice, the sound healing journey with crystal bowls needs the time and place, leader and students, plus the instructions for how to put it all together. Our retreats are becoming ever more integral, now mixing the mind of meditation, the sound of crystal, and the body of hatha and yin yoga. And there’s plenty of instruction on the theory of it all. 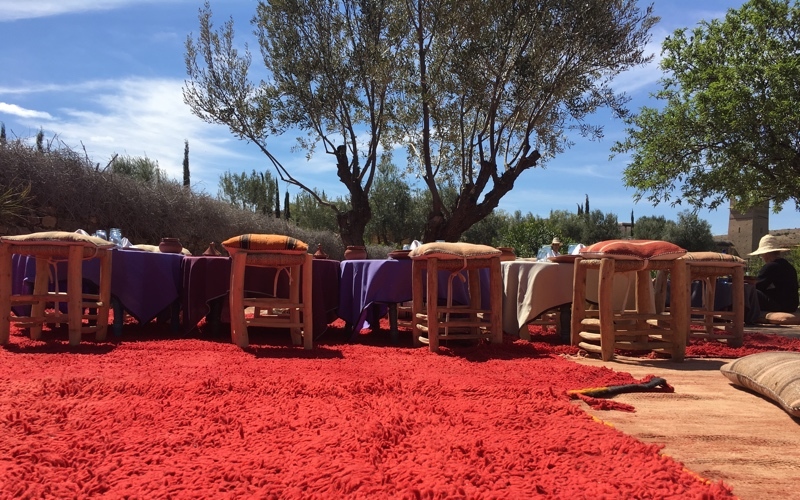 You can join us on the next retreat in one of our favorite countries, Morocco. The retreat runs from 6 – 12 May, 2018. The gardens of this Kasbah, supported by the local Berber village, are lush with roses, herbs, and vegetables all watered by small streams directed through intricate irrigation canals. The majestic Atlas Mountains form the backdrop for an unforgettable experience.